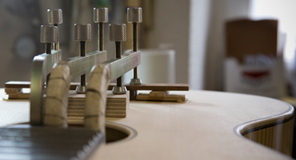 The workshop of classical guitar maker Angela Waltner is located in the heart of Berlin, one of the great centres of music nowadays. Her instruments stand out with their distinctive balanced design, best playability and responsiveness as well as with their noble sound full of liveliness and tonal width. These qualities offer an exceptional openness not only to classical music but also to many other musical styles. The artistry of Angela Waltner is based on a solid manual and scientific education, a professional experience of over 25 years and an extensive study of the different European traditions of guitar making. Her guitars are played by many outstanding musicians worldwide mainly in the field of classical music.